Port de San Miguel stands for Saint Michael's Port in English and, as its name implies, is the port of San Miguel town, located in the most northern part of the island. The Port de San Miguel is located in a distance of 5 kilometers from San Miguel town and it is far away from other touristic areas in Ibiza. In this area we find some apartments and hotels above the cliffs which allow us to enjoy the incredible views of the Mediterranean Sea just from our bedrooms. San Miguel is a 100 meters long 80 meters wide sandy beach protected by high rocks. If you are a hiking lover, you will really enjoy having a walk through the pine forests on its surroundings and be delighted by the incredible views. Port de San Miguel has a wide variety of places where to buy things, such as souvenirs shops and a supermarket. It also have some restaurants and bars to have a drink with the marine breeze touching your face. The beach of San Miguel also offers water sports of all kinds, such as diving, windsurf or banana boat. You can also play several sports on the beach, such as volleyball. The Cuevas de Ca'n Marça caves are a must visit if you are in San Miguel. Enjoy the incredible views to the sea while getting into this amazing cave. Ca'n Marça caves are one of the most attractive and less known touristic spots in the island of Ibiza. This cave is 14 meters above sea level and has more than 100,000 years old. This place, originally frequented by smugglers, will impress you with its spectacular stalactites and stalagmites. It is open all year round and it offers excursions both in summer and in winter. To get to Port de San Miguel is easy, as there are regular buses driving from the capital and from other towns to there. 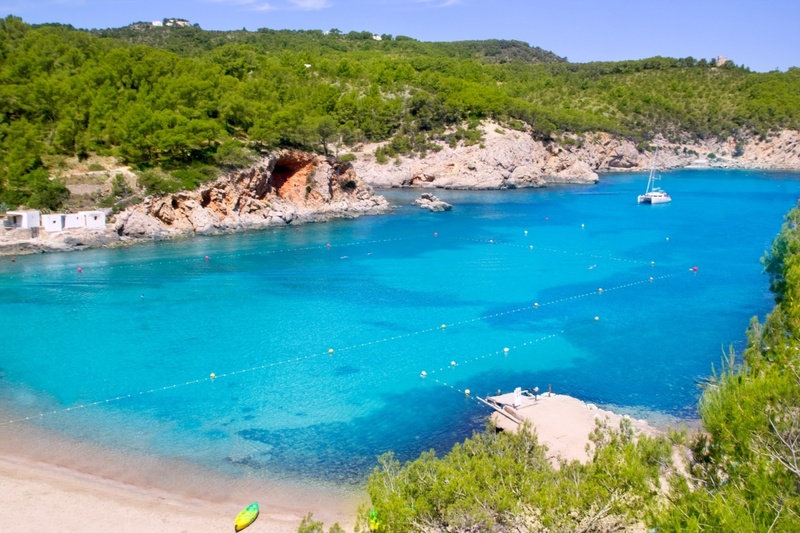 If you want to drive with your own car, San Miguel is just 25 minutes driving from Santa Eulària and from Sant Antoni. Once there, you will find a lot of parking options. Find information about selected Hotels, apartments and rooms in Port de San Miguel to choose the perfect place for your accommodation.